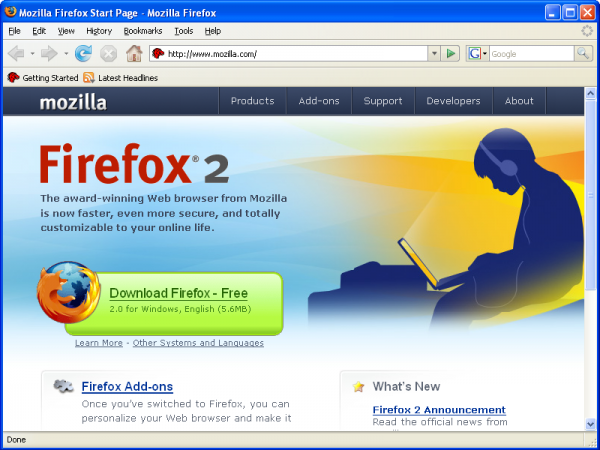 Less than a week after Microsoft announced Internet Explorer 7, Mozilla has now officially released Firefox 2.0. Numerous blogs and sites linked to Mozilla’s FTP server yesterday in belief that the software had been released earlier than expected, however Mozilla soon stated that the files were not official and were not meant for distribution yet. Either way Firefox 2.0 can now be safely downloaded from Mozilla.com. Tabbed Browsing – more custom options. close button added to tabs. session history. Spell Check – inline spell check for web forms. works with most online blogging tools. Search – real-time live results. search engine management options. Web Feeds – ability to add feed to live bookmarks, Thunderbird, Google reader, etc. ID Theft Protection – spyware/popup blocker. phishing protection. blacklists. One major difference everyone will notice is the close button which now appears on each tab. It will probably feel awkward at first, but it’s easy to adapt to. Mozilla should have offered a preference to revert back to the old close button at the end of the tab bar. However if you use the “middle-click” button the new feature won’t be an issue. Luckily most popular extensions for Firefox still function properly with 2.0, however Firefox users will still have to wait for many extensions to be updated. Another good note is that startup and page generation now seems to go much faster than on 1.5x. Even with several tabs open, Firefox no longer seems to hog as much memory as it once did. Overall, even with the new features, the program still feels as friendly as it once was. After playing around with both IE7, despite the improvements, Firefox 2.0 is the winner. If your computer doesn’t detect the update, go ahead and download it from the link below. We haven’t found any major bugs/issues just yet.